TheBungalow has a Queen Size bed. It has a palapa roof, a ceiling fan, a restroom, hot water and electricity. It has a beautiful view of the lagoon all day long from the deck with chairs and a hammock. Capacity: 2 people max. ThisBungalow has two Queen Size beds. It has a palapa roof, ceiling fan, a restroom, hot water and electricity. It has a deck with chairs and hammocks, as well as a private pool. Capacity: 4 people max. Stay with friends in our shared room. 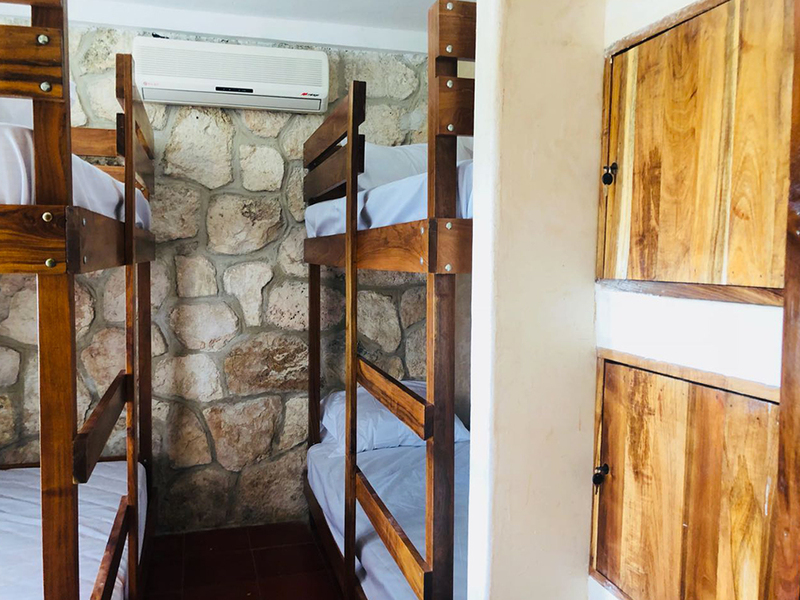 An area in our hostel with everything you need for a first level stay. It has AC, bunk beds, electricity and outlets. Capacity: 4 people max.